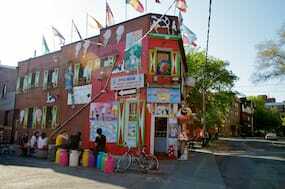 A while back, (two years ago actually), I blogged about Ten Places to Eat in Toronto and among them was an ice cream parlour, Dutch Dreams. Michelle and I have been longing for this ice cream for a couple years now, and finally we were able to stop by the other day (we were in the neighbourhood picking up some Revolution at the vet for our dogs). Yes, it is as good as we remembered! The only thing that seems to have changed is the price (much lower now at around $10 for two cones) and also the service has gone downhill a little bit. I remember it used to be staffed with exceptional, experienced and mature adults, but on our last visit, it seemed to be staffed by very young high school kids, much less focused on service… Not that we received bad service at all, it just wasn’t the same "complete package" that we got used to years ago. 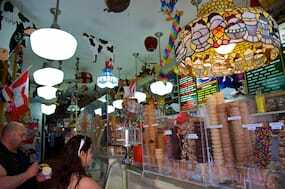 Nonetheless, our ice creams were both amazing! 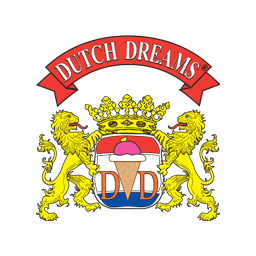 Dutch Dreams was published on Tuesday, June 8, 2010 at 8:33am EDT by Daniel Menjívar and last updated on April 11, 2018 at 9:30pm UTC .